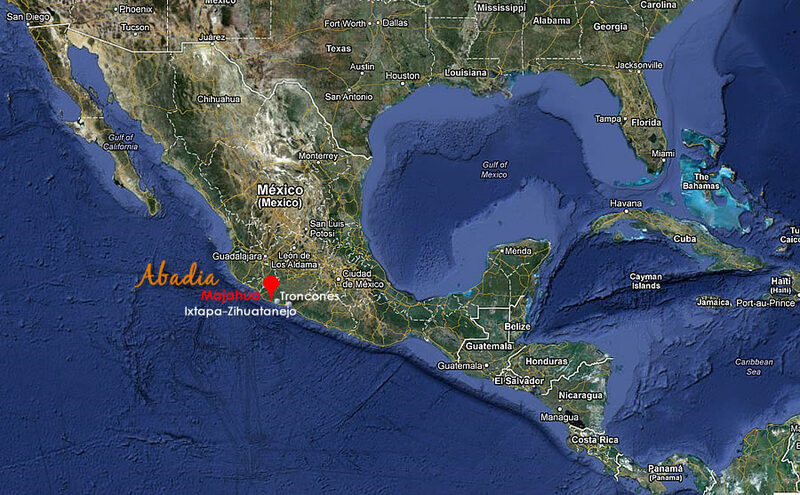 Abadia is located about 49 km (30 miles) north of the airport. Take 200 north. 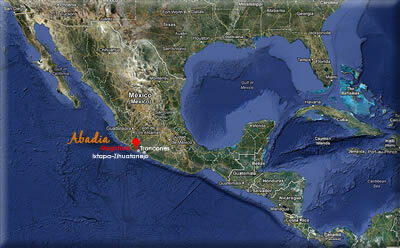 You will pass through Zihuatanejo. As you leave the town you will head up a large hill. At the top of the hill take the exit to Lazaro Cardenas (bypassing Ixtapa). Go about 32 km (20 miles). During this stretch you will have the option to go through several small towns or bi-pass the towns by following signs to Lazaro Cardenas. Either way you will get to the Troncones turn off. Turn left following signs to Troncones. Road ends at a "T". You are now in Central Troncones. From village central head north along the coast for about 3 km (2 miles) until you reach the next village called Majahua. Drive through Majahua. As you head out of the village take a left on the first dirt road. Follow signs to Majahua Palms. We are right next door to Majahua Palms to the north. Pass Majahua Palms entrance. We are the next dirt road entrance on the left (approx. 1/8 of a mile). Our friendly staff will be waiting and assist you with your luggage.